Now that we are home things aren't any easier. Hailey being on a continuous feed is a real pain. At this point I was almost scared of IT. It being, the food and making sure the bags are full and tubes are primed and machine is charged. It can be the tube site and cleaning it everyday and freaking out that I'm not doing it right. It meaning being in charge of all the medications and doctor appointments. Worse of all I was even kinda scared of Hailey. She would freak out when we touched her or adjusted her or especially if we transported her from bed to couch - couch to wheelchair - wheelchair to car seat - and vise versa. She would scream as if in extreme pain and she would cry and cry and it was horrible. I couldn't hold her, I could barely comfort her or calm her down. It had been WEEKS since I held her in my arms. I didn't want to hurt her or trigger her morrow reflex. It was driving me insane. I asked her pediatrician if this is how it's going to be or what's going on or if it's going to get better. Well...how was she going to know? She did say to give it time. Hailey has been traumatized with all the hospital stays and poking, and drugs and probably didn't know what was going to happen next. Every other time we were in a car we ended up in the hospital with her. It was incredibly hard. We avoided going anywhere we didn't have to. If we needed to go to the store Josh would go after an already long day at work. He ran all the errands while I stayed home. My house has never felt so small before. It was days and days before I even stepped out of the house. I decided that I had to get her out of the house before we went insane with cabin fever. I didn't want this to be a frivolous trip. If Hailey was going to cry from being put in and out of the car I better make sure the "In Between" time was something fun. I decided to take Hailey to her classroom Halloween Party. I had asked her teacher if that was okay and she had said of course! 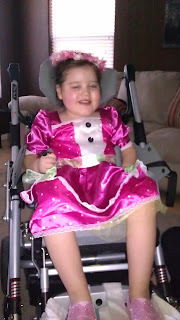 I dress Hailey up in one of her costumes. I say one because in the mist of all this happening with being in the hospital and out of state I never went shopping for a costume. 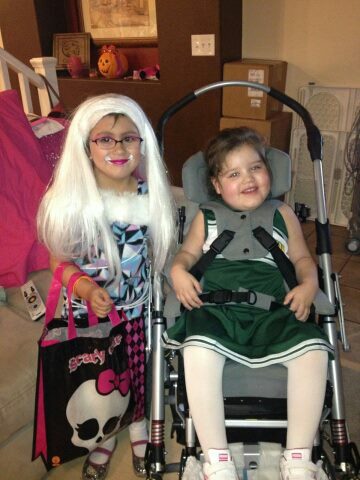 My older sister was great enough to have bought a costume and send it over for Hailey. Then Hailey's grandma had also bought a costume for Hailey as well. Dressing her was such a challenge but I don't think there is anything that isn't a challenge anymore. 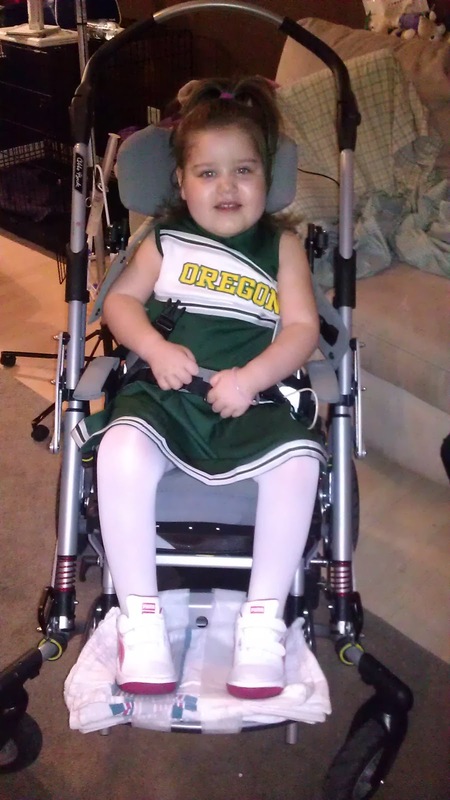 So I dress her and put her in the car (she cries) and I drive over to the school and get her in her wheelchair (again she cries) I wheel Hailey out to the playground where all her classmates are. As soon as I get close enough for the kids to see us they ALL come running to Hailey. They tell her that they missed her and it was so heartwarming to see and hear. Back in the class room things are a little odd because I didn't take into account that Hailey doesn't take anything by mouth and they are having a classroom party with cupcakes, juice and candy, none of which Hailey can have. That kind of broke my heart. I wondered if Hailey felt sad or frustrated that she wasn't "allowed" any of it. She was in good spirits as usual and in the end was happy to see her teachers and friends. We got ready to go with Hailey's cousin, my sister, my brother in law, my mom, my mother in law, my father in law, and Josh's grandparents, trick or treating! I know Hailey didn't get to eat any candy and it wasn't very practical to take a child in a wheelchair trick or treating because you can't wheel her up every single house because of steps, but I still think she had fun. We are still going to treat her like a normal 4 year old and do all the fun stuff there is to do. It may not be easy, but it'll be worth it.